The Martian Polygons - An evidence for former Seafloors? 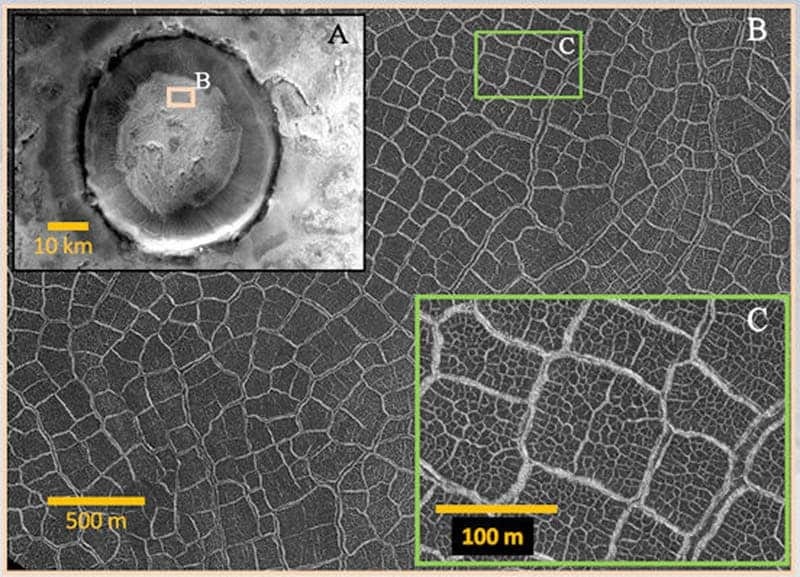 The Martian Polygons – An evidence for former Seafloors? Intricate polygons on Mars could be a clear indication of a wet past for the Red Planet. Most crater floor polygons have diameters ranging from 15 to 350 m, and it’s still not clear how and why they appeared – though one theory seems to be gaining ground: the idea of former lake beds. Polygons are some of the most common features at high latitudes on Mars. They have been observed by both lander and orbiting spacecraft. They range in size from 2 m all the way up to 10 km, and there is still an ongoing debate regarding their formation. Proposed mechanisms include thermal contraction, desiccation, volcanic, and tectonic processes; the polygons also bear similar resemblance to polygons observed on Earth, which took shape on the seafloor. In 2000, an analytical model based on fracture mechanics (El Maarry et al., 2010) showed that through thermal changes alone (no water), the maximum fracture spacing attainable is 75 meters, with more probable values revolving around 20 meters – so this is clearly not the cause here. Also, no exact tectonic processes which can cause such formations have been identified – so the only plausible possibility left is a former sea floor. On Earth, polygon-shaped areas, with the edges formed by faults, are common in fine-grained deep-sea sediments. Some of the best examples of these polygon-fault areas are found in the North Sea and the Norwegian Sea. We know this because the areas have been thoroughly surveyed through seismic techniques for offshore oil and gas deposits. While they are diverse and intricate, all polygons seem to have one thing in common – form in a common environment: sediments made up of fine-grained clays in ocean basins that are deeper than 500 meters, and when these sediments are only shallowly buried by younger sediments. The slope angle of the seafloor also plays a crucial role: when the slope is very gentle (or non existent), the shape of the polygons tends to remain unchanged. However, when there is some positive or negative topography, the shapes are often altered or broken down. So if this is indeed the case on Mars (and there’s little reason why it shouldn’t be), it seems pretty clear that we’re dealing not only with a water body, but with a water body which was at least half a kilometer deep. Furthermore, the variation of crater floor polygons sizes with location can be indicative of different hydrologic environments. So not only was there likely water on Mars – but it was likely a big and complex system.